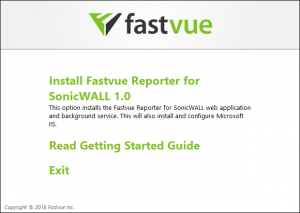 Download Fastvue Reporter for SonicWall and install on a machine (or virtual machine) that meets our recommended requirements for your network size. 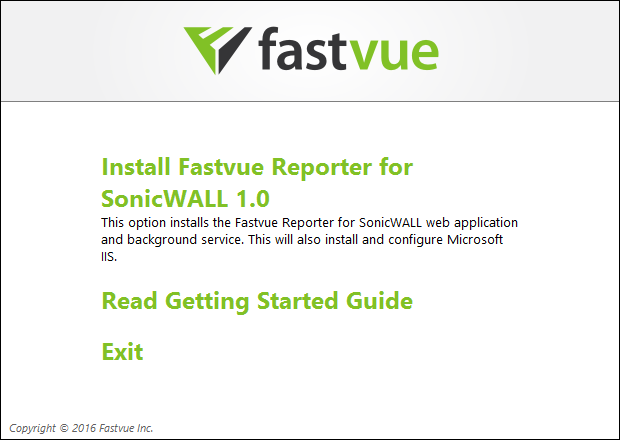 DO NOT INSTALL FASTVUE REPORTER ON YOUR SONICWALL GMS SERVER unless you know what you’re doing. Fastvue Reporter installs a website running on port 80 which may conflict with the GMS web interface. Fastvue Reporter is designed for 64 bit Windows Server Operating Systems running Windows Server 2008 R2 or above. The Web Server and Application Server Roles (.NET 3.5 and IIS) will be automatically installed and configured. The default data retention policy in Fastvue Reporter is 90 days or 50 GB, whichever comes first. This can be adjusted in Settings | Data Storage. The amount of data stored per day will vary depending on the amount of traffic flowing through your SonicWall. 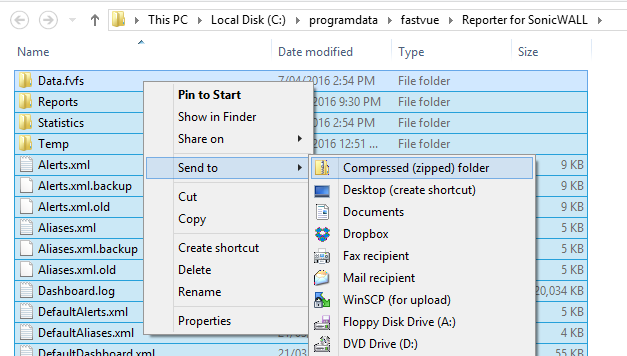 Check the amount of data in Settings | Data Storage after one day of installing to see if you need to make adjustments to the data retention policy. Configure SonicWall to send Network and Web Traffic events via Syslog to the Fastvue Reporter machine. Click the Enhanced Syslog Fields Settings: button and check all the available fields. 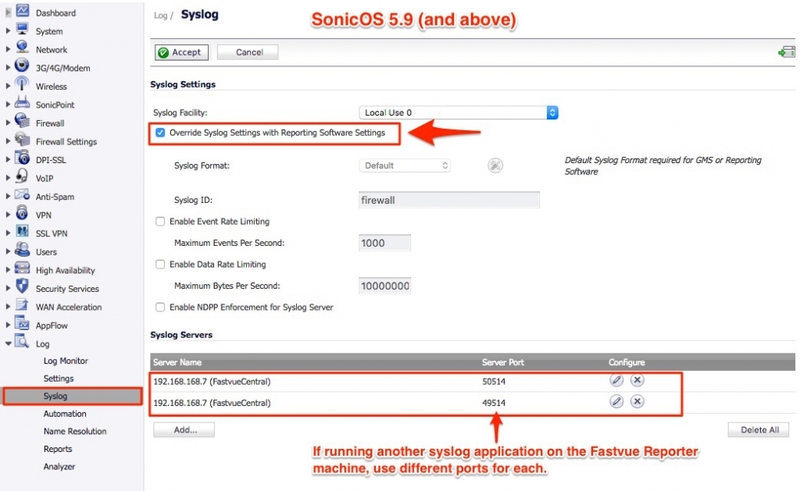 Under the Syslog Servers section, add your Fastvue server as a syslog server. 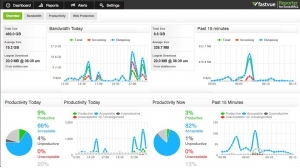 Go to Manage | Log Settings | Base Setup and expand the Log | Syslog section. Check the Syslog column for the Syslog Website Accessed events. Set the priority to Informational. Ensure you have SonicWall’s Content Filtering Services (CFS) enabled and active in Security Services | Content Filter. We also recommend deploying SonicWall’s DPI-SSL feature for reporting an alerting on HTTPS traffic such as Google Searches and YouTube videos. 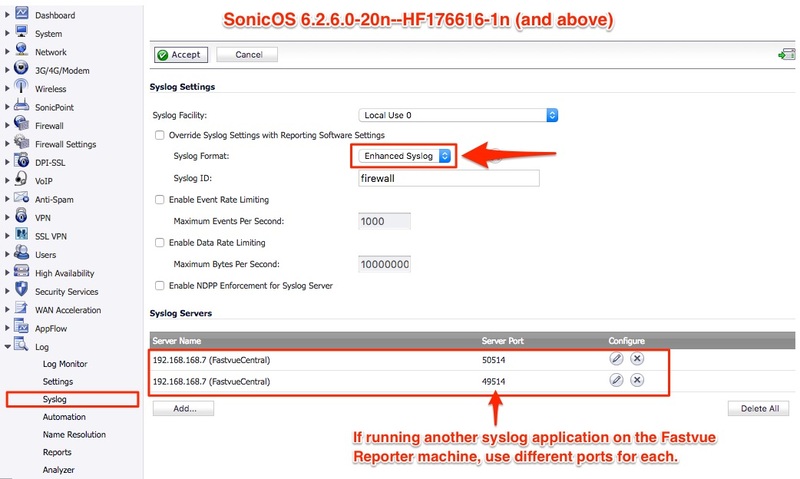 If you are running 6.2.6.0-20n, request hotfix 6.2.6.0-20n–HF176616-1n from SonicWall support to fix a critical logging bug. This fix will be included in 6.2.6.1 generally. Go to Log | Settings and expand the Log | Syslog section. Check the Syslog option for the Syslog Website Accessed events. Set the priority to Informational. 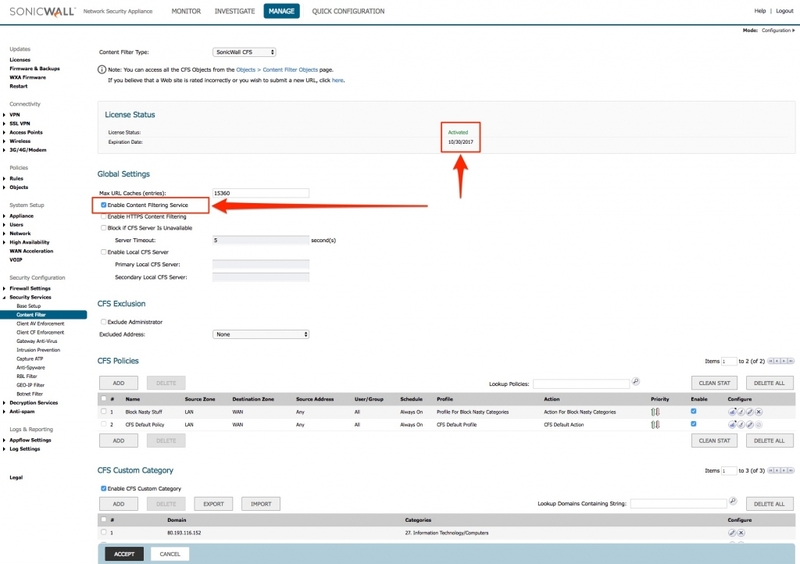 Go to Log | Syslog and check the Override Syslog Settings with Reporting Software Settings checkbox and click Accept. 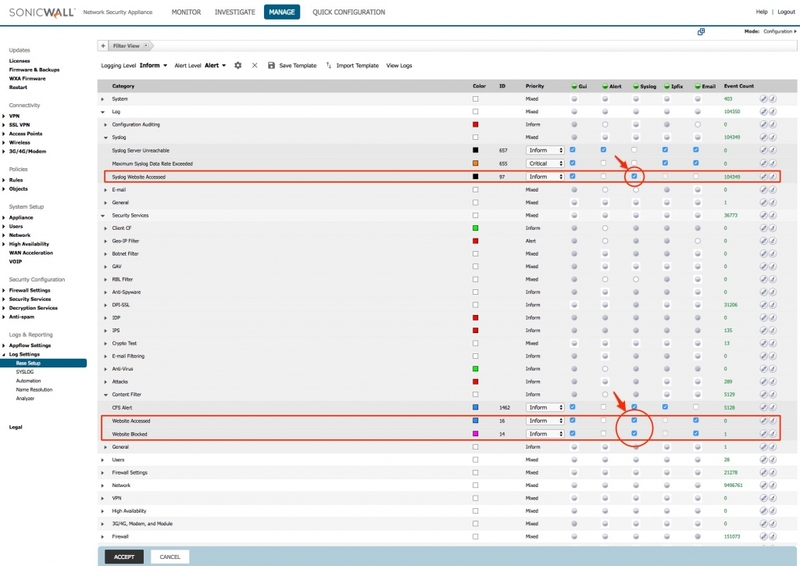 This option fixes an issue where URL Categories are not logged for Allowed traffic. Read more. 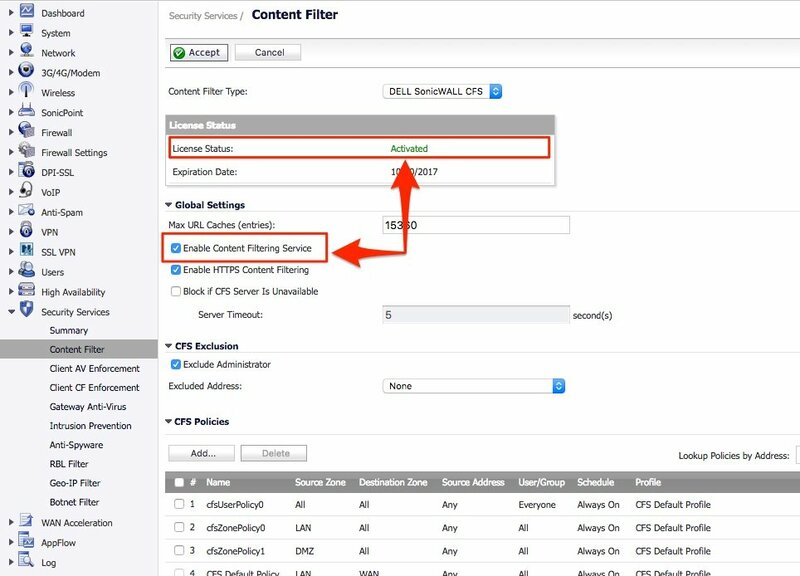 Ensure you have SonicWall’s Content Filtering Services (CFS) enabled and active in Security Services | Content Filter, either via App Rules or Zones and Interfaces, and that you have an App Rule or Zone configured to use CFS. In the Categories section, check the Syslog checkbox for the Network Traffic events. 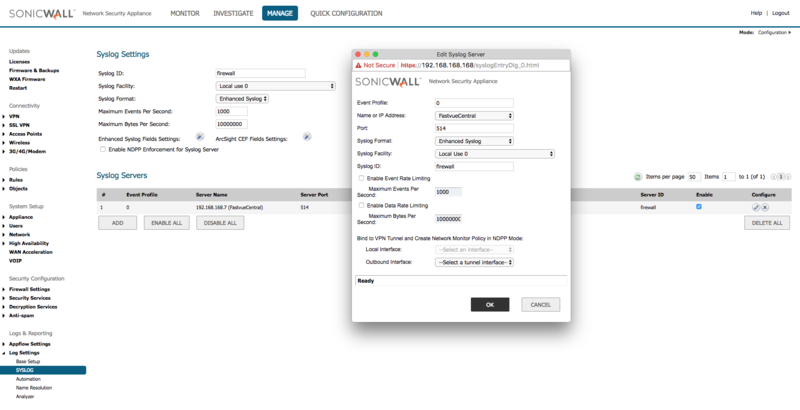 For more information, see our guide on The Best SonicWall Configuration for Detailed Logging and Reporting. 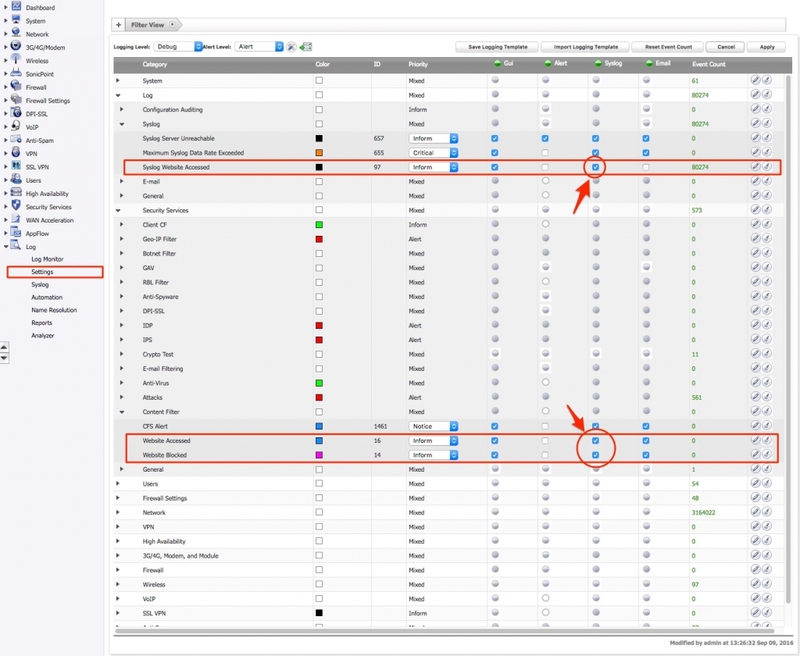 Add the SonicWall as a Source in Fastvue Reporter. This can be done on the start page that is presented after installation, or in Settings | Sources | Add Source. It may take 10-20 seconds before the first records are imported. You can watch the records and dates imported in Settings | Sources. 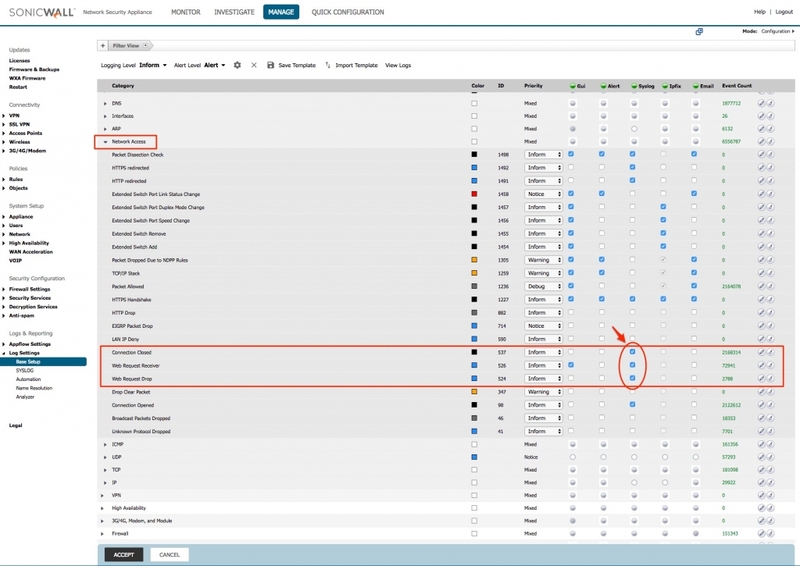 Once records start importing, you can go to the Dashboard tab to see your live network traffic. 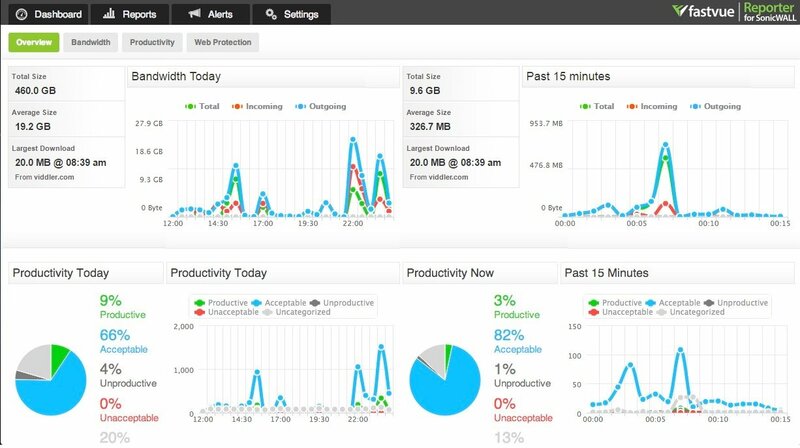 Live Dashboards (Bandwidth, Productivity and Web Protection). If you want to upgrade your existing installation, we recommend backing up your existing settings and data first. 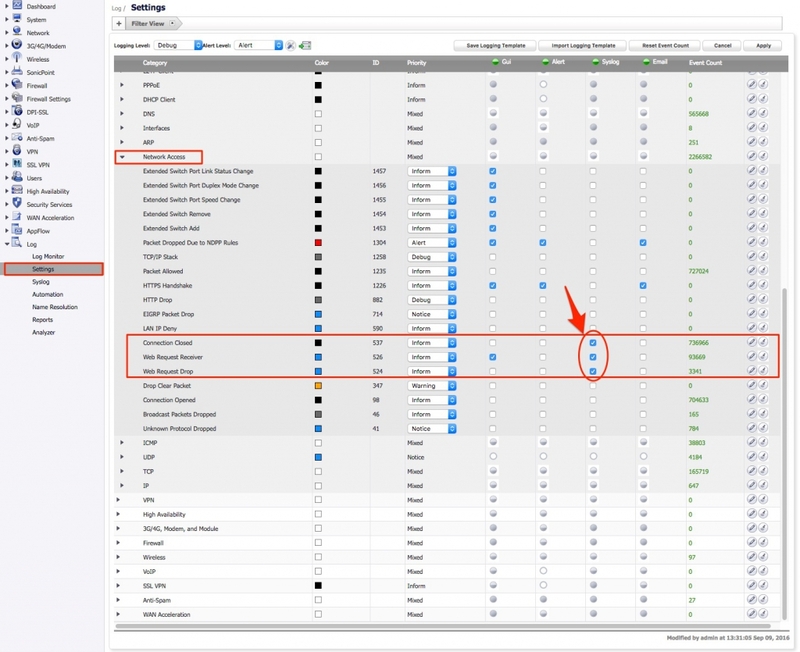 This is as simple as making a full copy of the contents of Fastvue Reporter’s data location, shown in Settings | Data Storage | Settings (default is C:\ProgramData\Fastvue\Reporter for SonicWall). 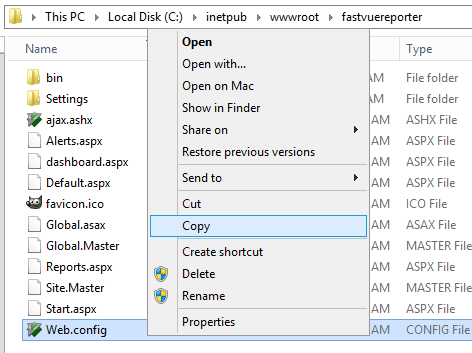 If you have secured the Fastvue Reporter website with IIS or applied any other custom settings in IIS directly, you should also backup the web.config file in the website’s directory (usually under c:\inetpub\wwwroot\). 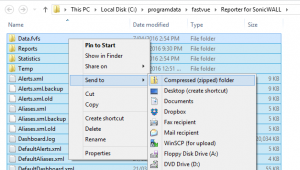 The installer will attempt to also backup and restore this file for you, but this is a good idea just incase there is an issue with the installation. Once your current environment is backed up, download the new installer and run it over the top of your existing installation to upgrade. The installer will pick up your existing settings, so just click next throughout the wizard without making any changes. Once installed, browse to the site and clear the browser cache by hitting ctrl + F5 (cmd + R on Mac).